Our neuters are very special members of the family, regardless of whether they started out as breeding cats or beloved pets. We don't rehome our cats after they have finished their breeding careers. Instead, they enjoy retirement (and kitten babysitting duties) to the fullest here at home with us. I always knew Serra's parents would make magic together, and after pestering Linda for months, she finally agreed it was worth a try. It was a pleasure to prove myself right! Serra is a dream come true, a real cuddler - she hasn't stopped purring and snuggling since she arrived from her Swedish homeland. We are forever grateful to Linda and Rob for this wonderful girl, who combines rare Norwegian and Swedish lines into such a beautiful "faît accompli"! Serra is the mother of litter 5, litter 7 and litter 9. She passed on her sweet temperament, remarkable golden eyes, and exceptional head type to her kittens. Cleo arrived home on Thanksgiving Day, 2016, and "thankful" does not begin to describe what we feel for this special girl. Cleo is the great-great granddaughter of our very first NFC and breeding female, Katie. 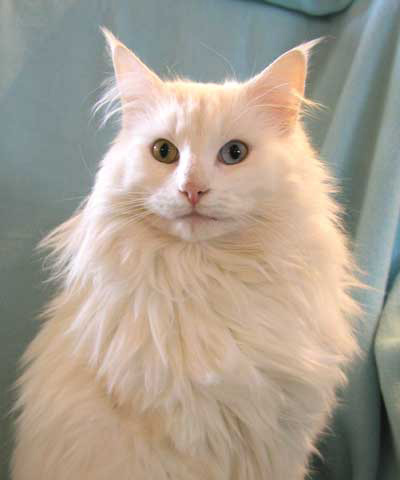 I have always been fond of cats without white, and when I saw Cleo on Sarah's web site, I was smitten. 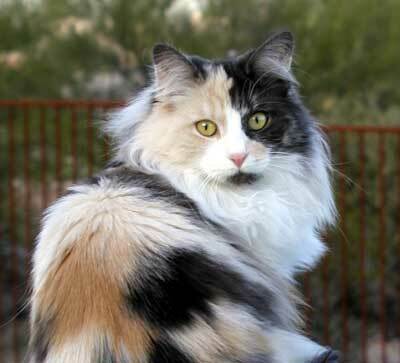 She resembles our very special Cocoa, the first kitten Katie had who was without white. Cleo was the only female in her litter of four, and her personality shone through her pictures. She is a talker (as was Katie), and she loves to share her opinion on just about everything. She isn't happy unless she's in the middle of whatever is going on around the house; whether it's something ordinary like cooking dinner or something exciting like putting up the Christmas tree, Cleo is VERY involved and everywhere she wants to be! Sarah, you have given us an amazing gift. Colleen, you were a big part of this, too. Our gratitude is without limit. Nigel was destined to enter our lives even before he was born. Both his grandfather Rudolfo and his uncle Freddy stole my heart when they were kittens, and Nigel is the culmination of a longtime dream continued by his daughters, Mandy and Bennie. He is co-owned and lives with Marilynne Roberts of Nordicwoods cattery; we can't thank Minna and Kjeld enough for sending us such a charming, beautiful boy. Nigel is the father of litter 5, litter 6, and litter 7. 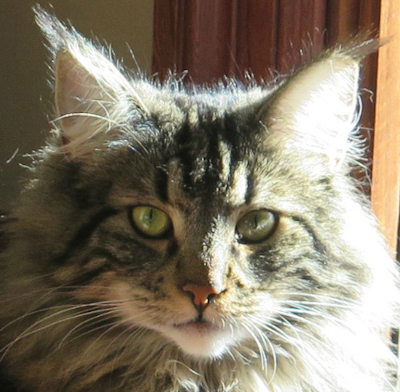 His kittens inherited his easygoing personality, marvelous coat, and gigantic lynx tips.